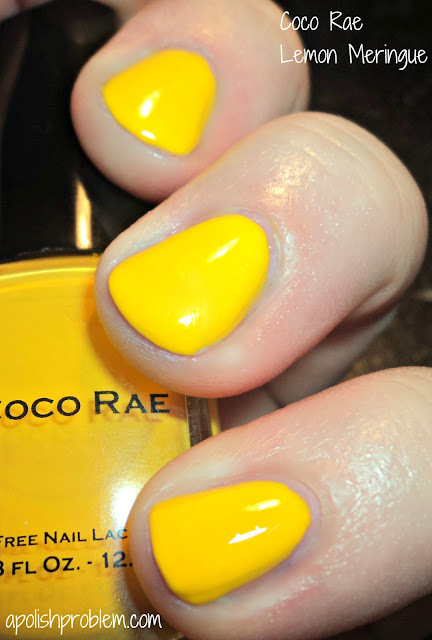 Today, I have for you a polish from a new polish line, Coco Rae. Recently, Courtney with Coco Rae asked me if I would like to review one of her polishes and I was so excited as I love trying new brands. Lemon Meringue is an amazing, bright, lemon yellow creme. I loved the color on this one. It wasn't too light and it also wasn't like an egg yolk yellow. I have only a handful of yellows, so it wasn't identical to any of the yellows in my collection. Also, I know with yellows, the formula can be a bit iffy. Yellows have a tendency to streak and take multiple coats to reach opacity. This one had a great formula, though it did take 3 coats of Lemon Meringue to reach full opacity. However, if you use a base coat and don't have blue-stained nails (like I do at the moment), I'm almost certain this could be a 2-coater for you. The formula is on the thicker side, but it's not unmanageable at all. I actually prefer yellow polishes to be thicker because they streak less. 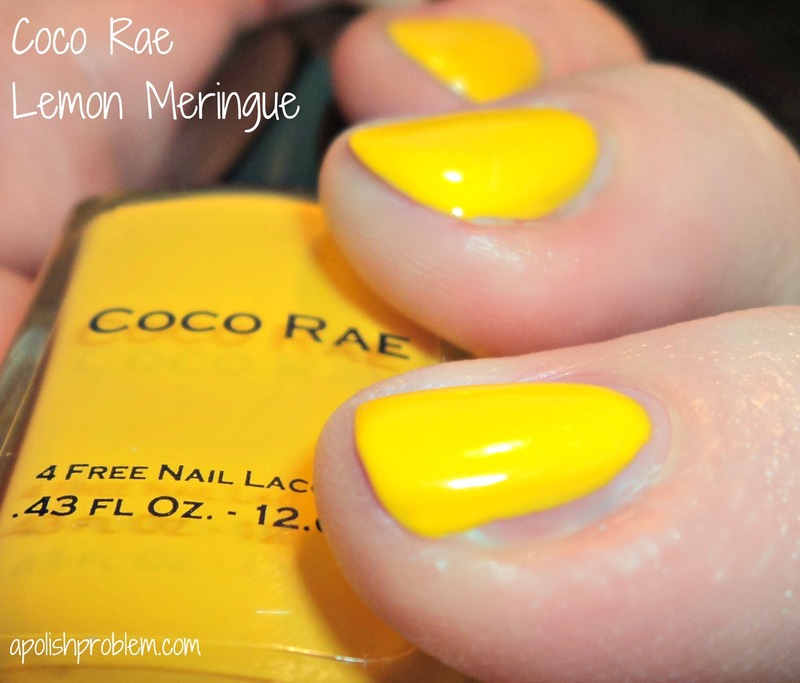 Lemon Meringue, and Coco Rae's full line of polishes, are available at their website, www.lovecocorae.com. Coco Rae polishes retail for $10 a 0.43 fl oz bottle, but it looks like they offer a "Deal of the Day" in which one of their polishes is $8 for one day only. It's bright, but yet not a neon. It's also really pretty for being a bright yellow. Almost reminds me of Zoya Pippa, but they aren't dupes. I think this is honestly the perfect summer yellow. I've found that a lot of yellows are either too muted, or too neon. Definitely going to have to get my hands on this one. wow! this yellow is very nice and perfect color..